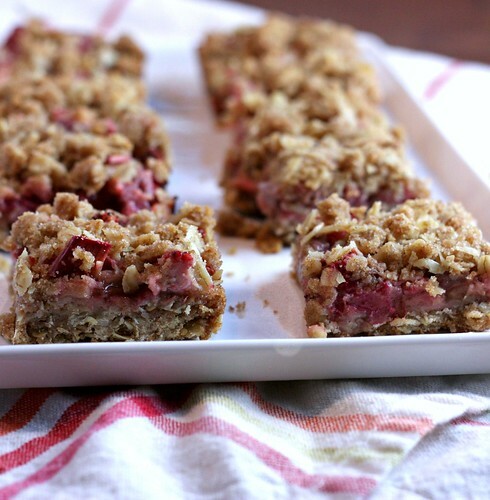 Strawberry Rhubarb Crisp Bars – Elly Says Opa! I don’t know who the first person was to pair rhubarb and strawberries together, but obviously, he or she was a genius. I guess it’s no surprise, what with both being in season at the same time and strawberries lending sweetness to tart rhubarb (and the other way around) but seriously, really good idea, Unknown Person. I love to make bars. We love to eat bars. The amount of Trader Joe’s “a ___ walks into a bar” cereal bars we go through is…well, it’s a lot. I’ve made jam bars countless times. I’ve added nutella. I’ve Christmassed them up with cranberries. 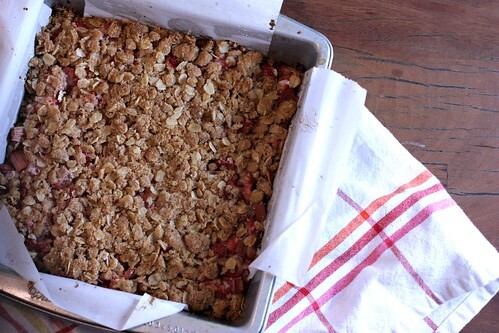 There is just no getting around the fact that fruit bar desserts are good and so, so easy. And they don’t have to be for dessert, either. Deb called these “breakfast bars,” which gave me license to have one each morning until they were gone. Fruit and oats = oatmeal, right? Preheat the oven to 375 and line a square baking dish with parchment paper. In a bowl, mix together the oats, flour, sugar, and salt. Pour the melted butter over the top and mix until clumps form. Press all but 1/2 cup of the mixture into the bottom of the prepared pan. Spread half the fruit over the crust. Sprinkle it evenly with the cornstarch, lemon juice, and 1 teaspoon of the granulated sugar. Spread remaining fruit over the top and sprinkle with the last teaspoon of sugar. Scatter reserved topping over bars and bake for about 30 minutes, until fruit is bubbly and crust is golden. Cool completely (you can do this at room temperature or in the fridge) before cutting into squares. Sprinkle with powdered sugar before serving, if desired.